Great news! NParks announced yesterday the Mandai mangroves and mudflats will be designated as a Nature Park. These are an important feeding and resting area for shorebirds, and home to many rare plants and animals. The shorebirds we see at Sungei Buloh Wetland Reserve depends on Mandai mangroves and mudflats (infographics by NParks). "The Mandai mangrove and mudflats, a rich feeding ground for migratory birds and home to the vulnerable Mangrove Horseshoe Crab, will become Singapore's newest nature park in mid-2022. The announcement on Sunday (Oct 7) by Second Minister for National Development Desmond Lee was widely welcomed by members of the nature community. The new status will allow the National Parks Board (NParks) to better monitor and protect threatened species of mangrove, crustaceans and migratory shorebirds, and will also give NParks teeth to enforce anti-poaching laws under the Parks and Trees Act. 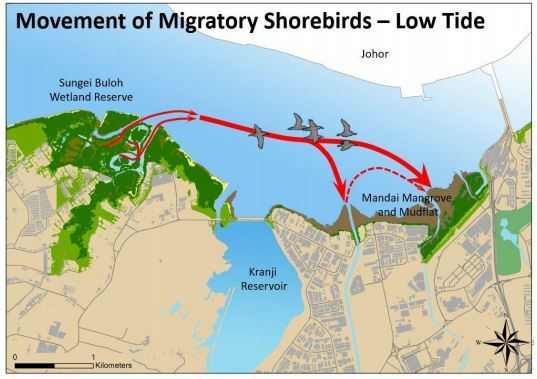 "This nature park will be sensitively managed by NParks, (it) will conduct habitat enhancement measures such as coastal clean ups and mangrove replanting," said Mr Lee, whose announcement was in conjunction with World Migratory Bird Day next weekend and the 25th anniversary of Sungei Buloh Wetland Reserve. 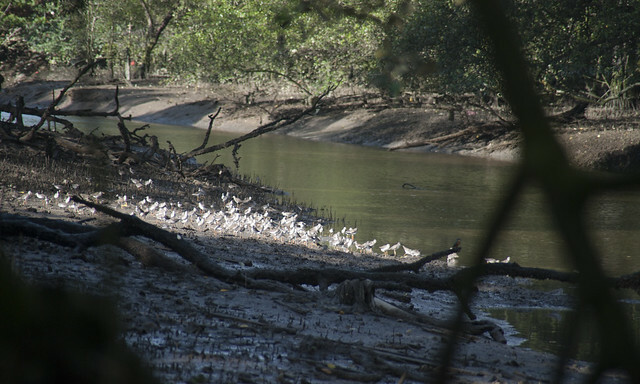 The 73-hectare nature park, sited 3km east of the 130-hectare Sungei Buloh Wetland Reserve, is currently state land. The conserved area will comprise a 26-hectare mangrove forest, which has 16 threatened species of mangroves, and a 42-hectare mudflat." Want to make a difference for Mandai mangroves and mudflats? Join the VERY tough cleanup of Sungei Mandai Kechil mangrove on 14 Oct (Sun) by International Coastal Cleanup Singapore. From the event page: "This site is difficult: we have to be very careful to prevent impact, and a lot of trash is trapped in the thorny and dense vegetation of the back mangrove. There may be snakes, hornets and glass pieces. We will be careful patient and tenacious!"